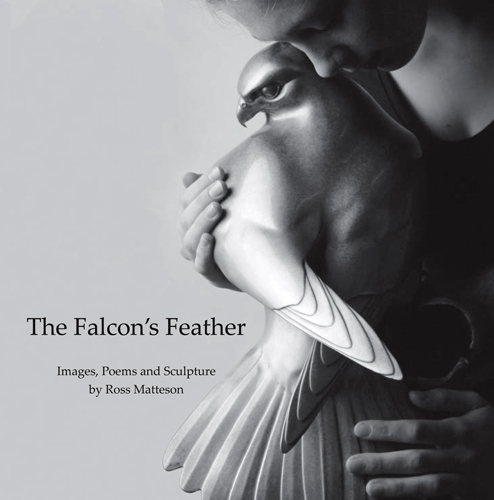 In this coffee table art book, Matteson presents black and white photographs of his bronze sculpture but also includes images of landscape, wild birds, falconry birds and human figures. The very tactile visual themes are complimented by poetry written over a 27 year period. M.J. Van Deventer, Director of Publications at the National Cowboy and Western Heritage Museum, writes, "Ross Matteson's elegant sculptures invite both touching and reflection. They invite the viewer to see these works of art as a metaphor for life. Now, in his sensitive poetry and his stunning photography, we see the ever broadening range of his immense artistic talent". Artist, Randal M. Dutra, shares "...as he expresses himself through varied media, his message remains positive and ultimately one of comfort". Artist, Philip McCracken, adds, "Ross Matteson is an accomplished sculptor, sensitive photographer, and in his writing as well, it is clear he has a deep feeling for the natural world. I wish him well on this journey". If you are interested in ordering this book, please call or email us for details. The price is subject to change but as of this update is $32.00. Very very few copies are left from the initial printing of 500.